I was SO excited to try this. I made these for Easter dinner and they turned out great! I've made crock pot baked potatoes, (coming soon to the blog) and other potato dishes. But this one turned out as one of my favorites! It went so well with the pork I cooked. I have to admit, it is AWESOME having 2 crock pots. Quick story... I had a crock pot last year and I used it for everything as usual, well I dropped the lid which caused the handle to break off, so my handy husband made another handle out of a hanger. Crazy I know, a hanger?! But it worked. Then I was transporting my crock pot to the church one day and it was a tight fit between a large bowl and the door, so I slammed the door to be sure it closed. Well on the other side of the crock pot the large bowl made a dent in the side! Talk about one SAD looking crock pot with a big dent and a metal handle on the lid! ha ha. Needless to say I bought another crock pot at the beginning of this year. I was going to just throw away the "sad crock pot" even though it still worked. My husband said, "Save it! You never know if something ELSE will break and we need it!" So I did. I have used both crock pots at the same time A TON this year! It's been great! I have put baked potatoes in one and steak stroganoff in another. Or mashed potatoes in one and sloppy joes or lemon pepper garlic pork loin in another! It is AWESOME! 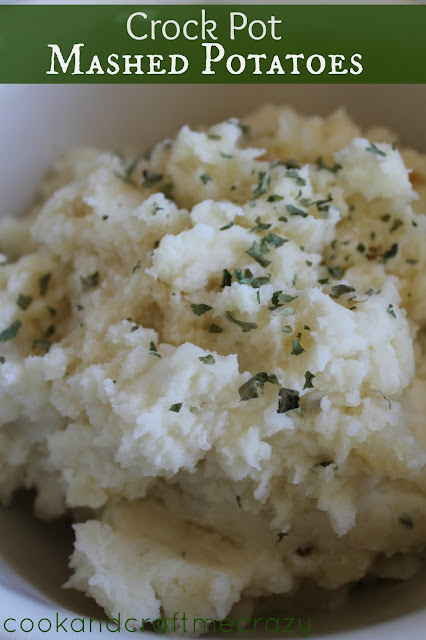 Well back to the Crock Pot Mashed Potatoes! These are wonderful! They are a great side dish to have done with your other crock pot meals. Simple, delicious and ready when you want them. Place all ingredients in the crock pot and cook on high for 4 -6 hours. When done, drain any excess water. In the crock pot add milk in 1/4 c. increments and butter while mashing to desired thickness. Salt and pepper to taste. Garnish with a couple pinches of parsley. Simple and DELISH! Great idea! I just got a new crock, so I definitely want to try this! I love your blog, so many fun ideas! Thanks for stopping by Printabelle! I haven't ever thought of doing mashed potatoes in the crock pot! Great idea! Thanks for linking up to Sweet & Savory Saturdays #8.